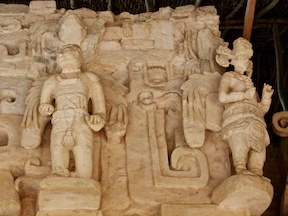 Ek’ Balam is a relatively small fortified Maya site, dating from the late Classic era. It’s renowned for its stucco sculpture at a large pyramid at the site (but has a number of other photogenic structures), and is a quick and easy side-trip from Chichén Itzá. A Photographer’s Guide to Ek’ Balam is a comprehensive guide to the ruins, with an eye toward making the photographs you take there the very best they can be. Containing 2 maps, 15 images, and 14 pages of site-specific material (if printed on letter sized paper), this guide costs $2.99. Once you purchase the eBook, write down your password (from Appendix C of the eBook), and head over to the Ek’ Balam supplemental page for downloadable extras. Buy the eBook for Kindle at Amazon.com (US store, UK store, DE store, FR store), for Apple devices on iTunes / iBooks, for Nook at Barnes & Noble, and for all other devices at Smashwords.